Transport details: Coaches provided by Unite the Union. Phone their regional office to book seats by ringing West Mids Reg Unite office: Sallie Aspindale 0121 647 4832 / or email membership.westmids@unitetheunion.org. Alternatively people can book via the web address or scan the code on the flyer. The Event against Britain First is going ahead on Saturday. This is despite media reports that the BF meeting has been cancelled. BF themselves are still insisting that their meeting is still on so we will be making it very clear that they are NOT WELCOME in Coventry. Please tell everyone you know, meet 1.00pm at Belgrade Square (note change of time). See you there! We condemn the threat by the English Defence League (EDL) to bring ‘protest’ to Coventry on May 21st. Fascist organisations such as the EDL and Britain First are trying to use the fear over terrorism and war to whip up racism and direct hatred against all Muslim people. Coventry is a city which has a very proud tradition of promoting peace and unity. Our city was built on tolerance and respect for the huge contribution made to our city by people from many different backgrounds. Coventry has a proud history of combating racism in all it’s forms. Coventry is a great city, because it is built on immigration and by refugees finding sanctuary here. We must not give a quarter to those who would judge an entire religion, race or nationality by the actions of a few. The EDL have no solutions for real problems in our society. They have nothing to offer on jobs, housing, young peoples services, education or the economy. The EDL offer no future for Coventry people of any background. The EDL want only to see Muslims attacked and a race war on our streets. We condemn them and oppose their attempts to call “demonstrations” to exploit these issues. Jewish, Sikh and Hindu organisations have all spoken out publicly to condemn the EDL and have refused to be used by the racists and fascists. When EDL supporters tried to whip up Islamophobia under cover of a supposed LGBT ‘pride’ event in east London, local LGBT organisations refused to let the racists hijack the traditions of pride. We need to show we are not complacent. We will not allow the EDL to use our city as a platform for their agenda of hate. It is the EDL who are the outsiders and the violent threat to all in Coventry. We also call on the media and politicians to stop using inflammatory language that feeds the fascists and racists. We must reject those who want to divide our communities and set them against each other, and stand fast to the ideals of anti-racism, multiculturalism and respect for all. We will therefore be supporting the #wearecov peaceful protest against the EDL in Coventry to celebrate our proud city and show that fascists will not be welcome here. We urge as many people as possible to support us and attend. “It was brought to our attention that the Lime Tree Club was hosting performances by some Neo Nazi rock groups. Representatives of Coventry Against Racism met with the Lime Tree Club committee back in January 2015. We explained to them the nature of the events they were allowing to be booked at the venue. We told them that the organisations that were booking the events were linked to Extreme Right-wing organisations across Europe and that several of the bands that they booked for the events had Neo-Nazi links. We let them know that the events were attracting Nazi sympathisers from across the UK and that the reason why the location of their event bookings were only released a few hours prior to the events being held was to prevent counter demonstrations by groups and organisations opposed to Racists, Fascists and Nazis. In October whilst the rest of Coventry were building towards the commemoration of the 75th Blitz anniversary, the Lime Tree Club chose to allow the hosting of yet another event by the same organisation. Coventry is a city of fair play, peace and reconciliation. So the Lime Tree club lets down the majority of its customers by continuing to stage hate performances by Neo- Nazi rock bands. Coventry Against Racism tried to talk to representatives of the Lime Tree club but no real progress was made, as these hate performances still continue. So after we raised this matter to Coventry City Council, it was decided by council officials to de-list the club from the Council’s community directory. This is a positive move as the Lime Tree club frankly risk tarnishing the image of Coventry. We, at Coventry Against Racism, very much hope that common sense will now prevail and these Neo-Nazis events in our city will stop”. Coventry Against racism is a broad based community and trade union group that campaigns against racism in all its forms in Coventry and wider. Over one hundred local residents protested against the Nazi Infidels group in Coventry today. 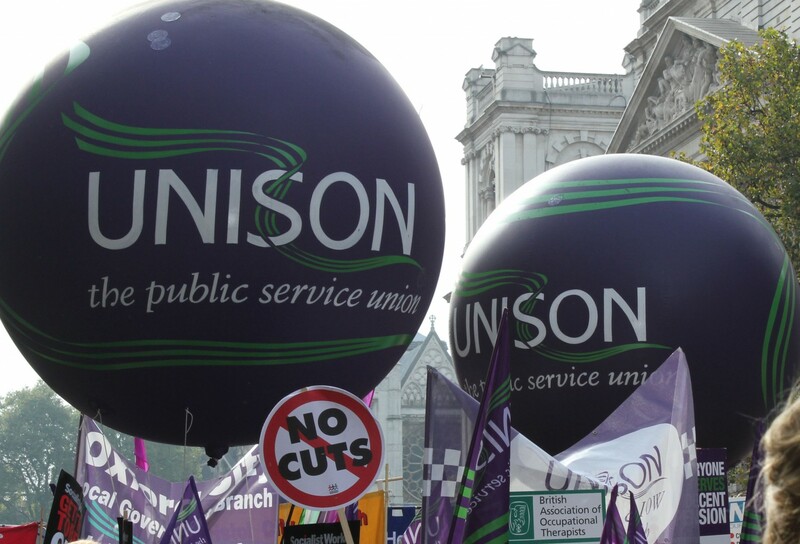 The protest was coordinated closely with the Coventry Trade Union Council May Day Rally. Local residents joined in increasing numbers as we explained why we were there and who we were opposing. Passers by thanked us for showing where Coventry people stand. Trade unionists, including Unison, young people, anti racist campaigners, local election candidates and pensioners all spoke out in support of Coventry being a city built by people from all backgrounds working together. Many pointed out that the Infidels pose no solutions to the real problems we face. A minutes silence was observed for Daniel Kirkwood and thanks expressed to his family who made a superb statement against the far right to the local paper, despite incredibly difficult circumstances. We ensured that we retained our position in Broadgate, right in the centre of town. The Infidels spent most of their time getting drunk in a local pub until they were escorted through the back streets to the near deserted Council House Speakers Corner. Their ‘national’ mobilisation could only muster 30 in support, nearly all old National Front supporters.